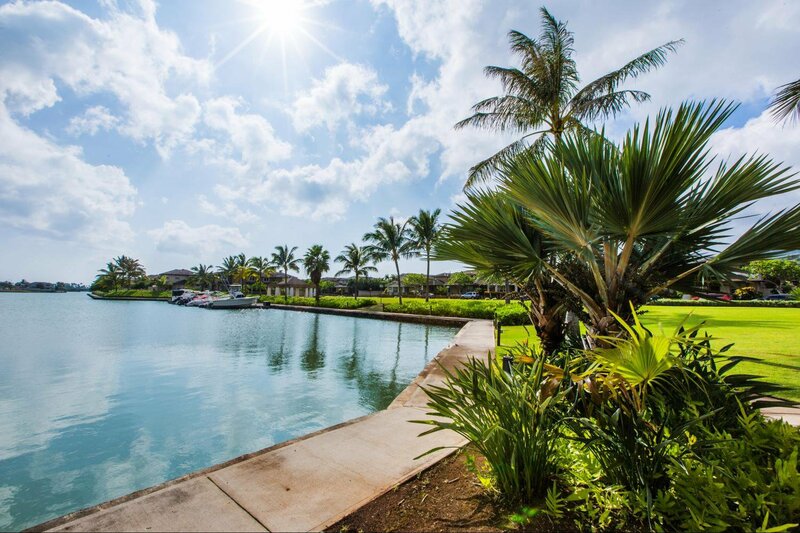 Walk out your back door to your tropical yard on the marina. Use your private gate to walk along the wall and explore. Barbecue while watching boaters glide by on a sunny afternoon! Kick back and relax at Ohana Kai, where you have a large, family-size couch, beautiful wood flooring, full air conditioning, and of course wireless internet. Your contemporary island hale awaits! As you enter, you are greeted by a stylish and cozy living and dining room with marina views. Cook up your favorite fresh island seafood, mix a classic mai tai, and turn on your favorite tunes. Enjoy the beauty that surrounds you at Ohana Kai! Kitchen and local fruits to be enjoyed. View from the dining room, which attaches to the kitchen and living room. First-floor master bedroom with en suite bathroom and sliding door that leads to the back yard. Marina-front backyard views from the master bedroom. Master en suite bathroom with walk-in closet to the left. Second-floor queen bedroom with desk. Contemporary second-floor twin bedroom with sofa bed. Second-floor full bathroom for the twin bedroom and queen bedroom. The view from the dining room sliding door. 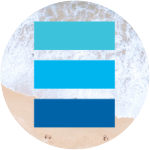 Elite Pacific Properties, LLC: Ohana Kai in OAHU SOUTH (Honolulu & Waikiki). Ohana Kai is a 3 bedroom, 2. Enjoy your own waterfront slice of Hawaii at Ohana Kai! Located in a gated community along Hawaii Kai’s stunning waterway, you’ll enjoy marina and Koko Head views from every room. Unwind in the casual charm of this peaceful paradise with its open floor plan and stylish details. Ohana Kai is a corner unit featuring a first-floor master bedroom with delightful en suite bathroom, walk-in closet, and sliding doors that open to the backyard. The spacious living room boasts cozy seating and the dining area is perfectly positioned to take in the view. Ohana Kai offers a fully equipped contemporary kitchen with breakfast bar. Upstairs, bedroom two offers spacious accommodations with two twin beds and a sofa bed. Bedroom three is light and airy with a queen bed and desk. Both bedrooms conveniently share a full bathroom. Air conditioning, wireless internet, cable television, and laundry facilities ensure you’ll enjoy all the comforts of home during your stay at Ohana Kai. On the back lanai you’ll find a barbecue grill, dining area shaded by a large awning, and several sets of chairs for relaxing. The yard also provides access to the waters of the marina and a front row seat for the colorful Hawaii Kai sunrise. Following the marina path will lead you to a tranquil garden and a park with play structures. You’ll be delighted by Ohana Kai’s ideal Hawaii Kai location in South Oahu. Koko Marina is just a two-minute drive from Ohana Kai where you’ll find dining, shops, a movie theater, a fitness facility, and access to a wide range of water sports. A five-minute drive takes you to some of the most celebrated beaches on the island including Hanauma Bay and Sandy Beach, and downtown Waikiki is a quick 15-minute drive! The east side beaches of Waimanalo and Kailua are a 30-minute scenic drive away. 1. Rates and fees are subject to change. One rental per 30 days, minimum stay requirements may apply. Inquire for possible discounts. 5. Air conditioning notes: this home has split central air conditioning in the living room and bedrooms. 6. Included electricity cap: $250 for seven- to 14-night stays and $500 for stays of 14+ nights. 7. Special term: guests must follow all complex house rules.